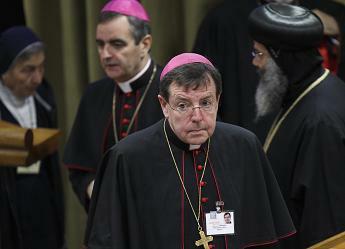 After two weeks of speeches, discussion, study and prayer, the Synod of Bishops on the Middle East came to a close. The last order of business was to had over to the Holy Father a list of recommendations regarding the current situation of the Churches in the Middle East. It's a long list of propositions. Some might say they're not concrete enough, others might be surprised by the straightforwardness of some propositions. What is actually important is that the Bishops will now go home with these propositions and ideas burned in their minds and their hearts - and Holy Father is left with the propositions to assess as he begins to put together his exhortation about the Middle East. The propositions are too numerous to list here. Go to the Vatican website for the full list of the Synod Fathers' propositions.